​Wildfires are devastating, consuming everyting that lies in their path. They burn with great intensity. What was once alive, vital and flourishing becomes nothing but charred remains and ashes. ​Trials and troubles in our lives many times begin with a small spark yet turn into a great raging fire, consuming everything and everyone around us. Family. Friends. Careers. Homelife. When the wildfire finally subsides, all that we have left is a heap of ashes and burnt out hopes and dreams. ​But, just as new life springs from a wildfire ravaged forest, so can new life grow from the ashes of your personal wildfires!! What hope we have in God, the author and perfector of our faith, the creator of all mankind. He will raise us up from the pile of ashes and restore our life again! ​“Forget the former things; do not dwell on the past. See I am doing a new thing! 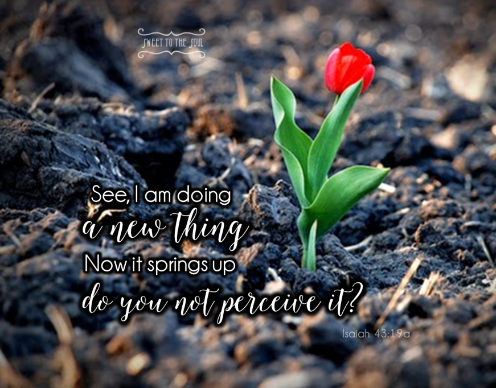 Now it springs up; do you not perceive it? ​If you are in the midst of your wildfire friend, seek shelter under God’s promise of protection. Then when the smoke clears and you emerge, take comfort in God’s reassurance that the growth of a new life will spring forth! This is beautiful, Jana! I'm going to expect to have my prayers answered! Short and sweet this post is! I'm believing with you for new life today! This is completely FOR ME and I am THANKFUL! God is doing a NEW THING NOW. Amen.